In many states that have legalized medical cannabis, the law states that dispensaries aren’t allowed near schools and educational institutions due to the fear of regulators that it would only encourage underage cannabis use. However, a new study says that this fear is unfounded. The report, which was published in the July issue of the Journal of Adolescent Health, analyzed national data of over 46,000 adolescents from California, and revealed that the number of cannabis dispensaries within 3 miles of a school didn’t equate to a spike in teenage cannabis consumption. The researchers also found that the variety or cost of pot products offered in the dispensaries had no impact on underage use. The study’s authors, who are from the University of California San Diego Department of Family Medicine and Public Health, concluded that when it came to the presence of marijuana dispensaries near schools, neither proximity nor price had an effect on teen cannabis use. “The distance from school to the nearest medical marijuana dispensary (within 0 to 1 mi and 1 to 3 mi bands) was not associated with adolescents’ use of marijuana in the past month or susceptibility to use marijuana in the future, nor was the weighted count of medical marijuana dispensaries within the 3-mi band of school,” reads the study. More importantly, the study found that the availability of alcohol and tobacco has led to an increase in teen substance abuse. “Despite the strong relationship between retail outlets and alcohol and tobacco use documented by a number of studies, examination of the associations of medical marijuana dispensaries with marijuana use remains limited,” writes the researchers. The researchers do caution that the study’s findings “should not be used as evidence against marijuana regulation strategies such as licensing, zoning ordinances, taxation, or policies to limit product type.” Instead, “the findings illustrate the current state of the medical marijuana environment.” The study builds on past evidence that can be used against opponents of legalization, who often argue that the quantity of cannabis businesses in a certain area can result in societal ills, particularly increasing underage use – at the very least, in California, where the data has been collected. The findings aren’t exactly new, since a group of published studies have come up with similar findings in the past. In California, where cannabis has been legal since 1996, researchers have found no evidence that teen recreational use of the drug has increased since then. “Several years ago, before the group of papers we [analyzed] started to be published, people thought that medical marijuana laws would increase teen marijuana use by ‘sending the message’ to teens that marijuana was safe and acceptable to use,” explained Deborah Hasin, a lead author of one of the newer studies. 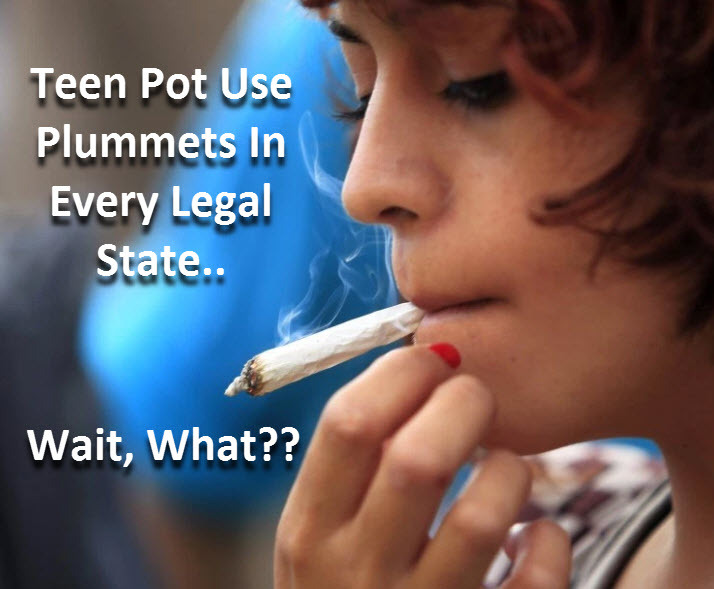 But, “it doesn’t seem that teens were impacted much by this — perhaps because they didn’t find the legalization of medical use very relevant to them or didn’t even know about the laws,” she adds. “Although we found no significant effect on adolescent marijuana use, we may find that the situation changes as commercialized markets for medical marijuana develop and expand, and as states legalize recreational marijuana use. However, for now, there appears to be no basis for the argument that legalizing medical marijuana increases teens’ use of the drug,” she adds. But when one considers the harms of tobacco and alcohol use, it’s clear that even if our youth choose cannabis, they’re in good hands. TEEN MARIJUANA USE DROPS AFTER LEGALIZATION, CLICK HERE. 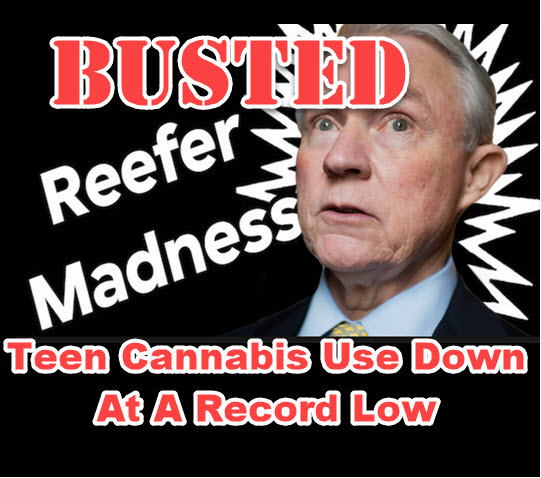 TEEN CANNABIS USE AT RECORD LOW, JEFF SESSION, CLICK HERE. 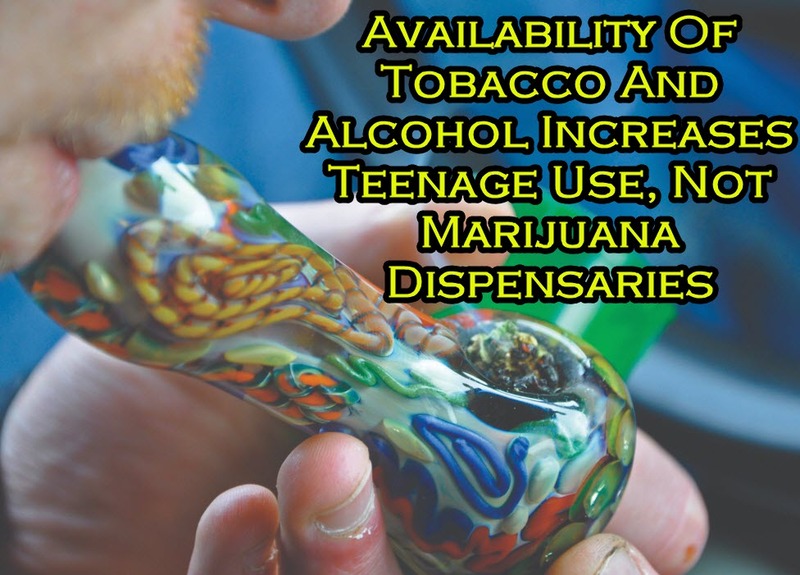 Alcohol, Availability, Dispensaries, Increases, Marijuana, Teenage, Tobacco. Bookmark.